Hamsa Centered - LIVE, BELIEVE, INSPIRE. "Oceans of Energy" - made with intention to allow energy to flow through us onto others with just the mere intention - for the healing hands of the world. The hamsa is the symbol of an extended hand and literally means “fivefold” (from “chamesh”, five); it is usually drawn artificially stylized so that thumb and pinky are identical lengths and the hand is symmetrical rather than left or right. 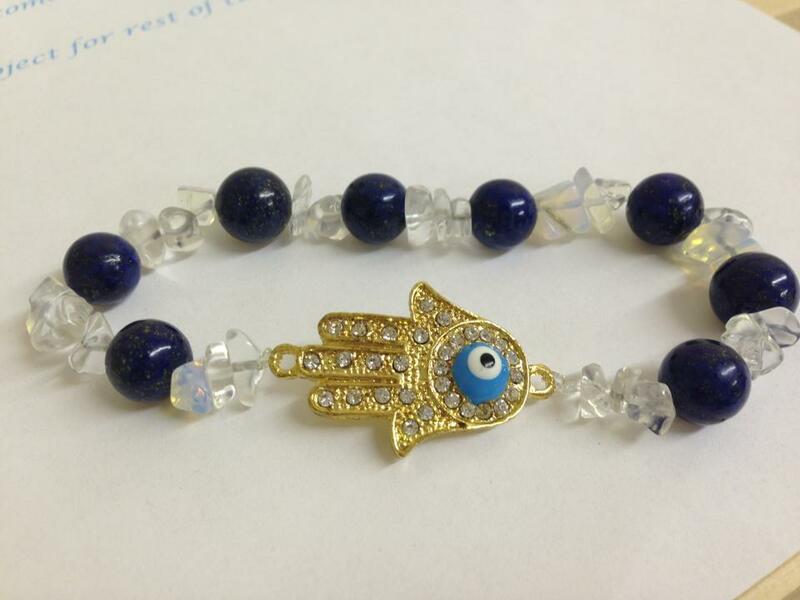 Hamsa - Its first meaning is the extending of one’s hand toward another, in a gesture of peace, blessing, and fellowship. From this meaning is derived (by drash) its symbolism for communal prayer, one for another, and particularly the two prayers of initiation and restoration. From these meanings are derived its use as a symbol of welcome (initiation) and of healing (restoration), including physical healing. However, the power of the universal gesture is that the universal energy field, which works through order rather than force, is most easily transmitted through the hands. From this fact is derived the principle that smikhah (the “laying on of hands”) can physically confer benefits. It takes from what belongs to the givers (status, authority, and leadership among others, health, vitality, and peace within oneself) and transmits it to the receiver. Sodalite is associated with the thyroid. Wear it when you want to lose a few pounds. It helps in communicating and will give confidence to speak more. Brings good fortune - Assists in foretelling the future - Enhances intuition -Promotes inspiration. Brings success in love as well as business matters Offers protection on land and at sea The moonstone is associated with the moon and was the stone of the goddess Diana. The most powerful time to use the moonstone is in a full moon. It has been worn as an amulet to bring good emotions to the wearer, while protecting those of a sensitive nature. It can reunite lovers who have quarreled. Moonstone is also considered a good luck stone. 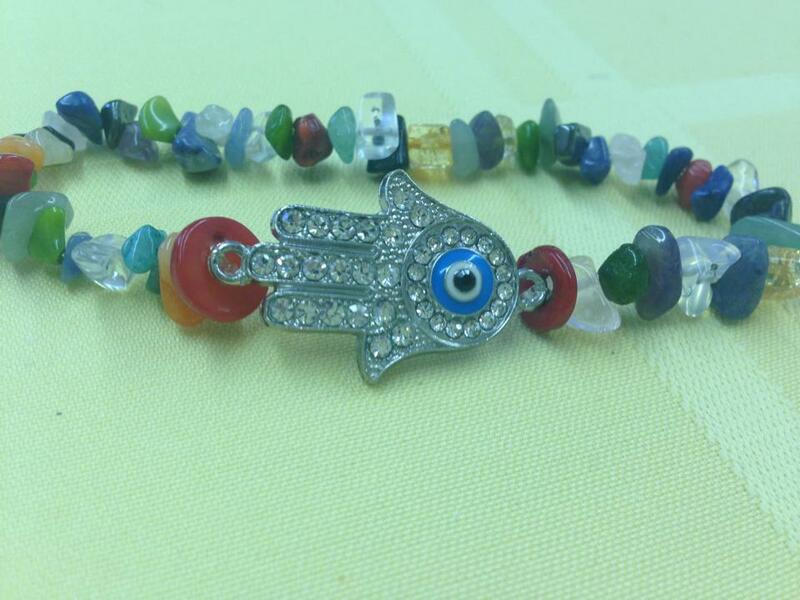 Hamsa Centered with added evil eye protection - surrounded by chakra colored natural earth stones that carry a variety of healing properties. Made with the intention to ward off any unintentional or intentional jealousy.